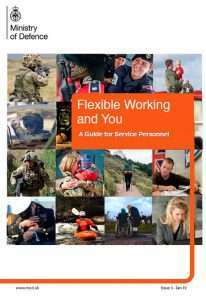 Flexible Service (FS) is a free, easy-to-use tool for you to learn more about working part time and/or restricting separation from your base location for a temporary period in the Armed Forces. Please note that this is an interim solution which will be available until the introduction of Discover My Benefits in 2019. 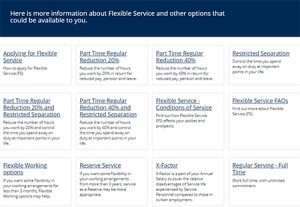 Here is a free, easy-to-use online tool for you to learn more about working part time and/or restricting separation from your base location for a temporary period in the Armed Forces. FS is a temporary arrangement from 3 months to 3 years and can include Part Time working (20% or 40% reduction) and/or Restricted Separation (from your base location). To learn more about the offer, you can access all information online. To find out how FS may affect your pay and leave, click on the comparator button below. The comparator will also show information if you were to choose to move to Reserve Service.